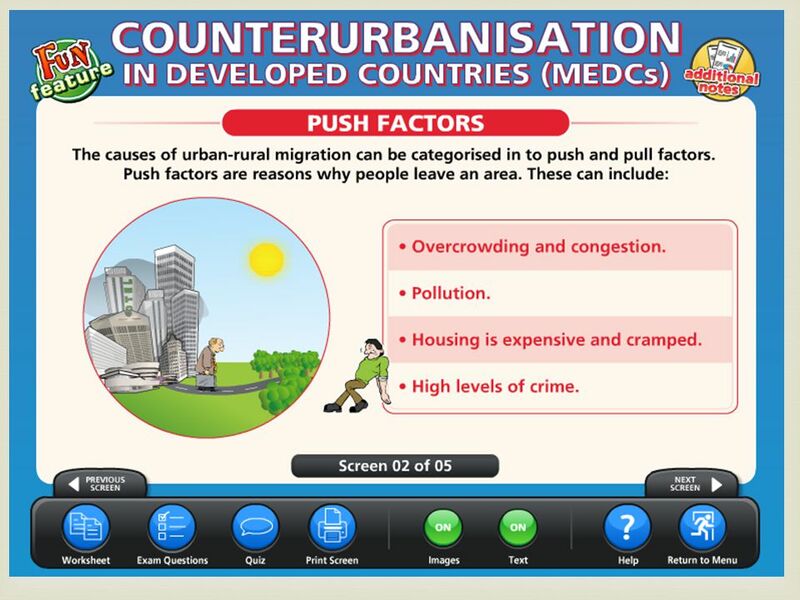 Counter Urbanisation. Name and explain problems faced by developing world cities Name and explain problems faced by developing world cities Explain the. 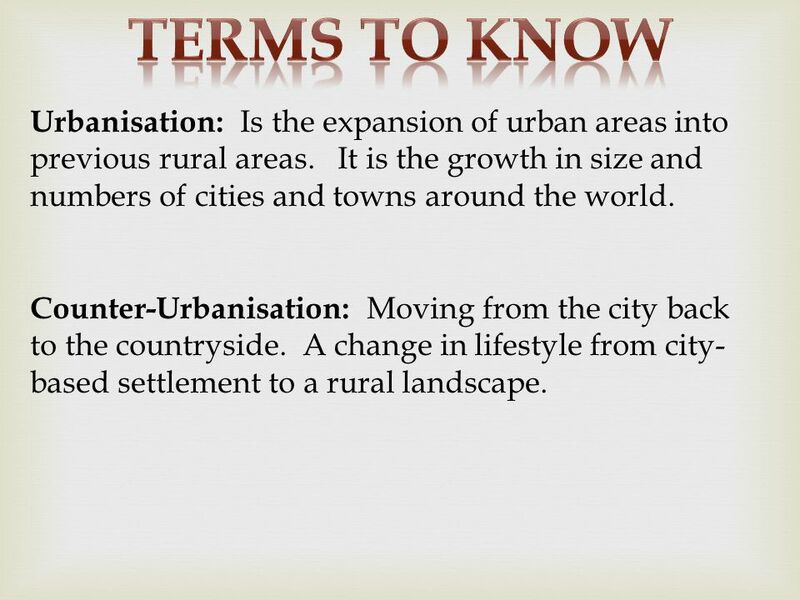 3 Urbanisation: Is the expansion of urban areas into previous rural areas. It is the growth in size and numbers of cities and towns around the world. 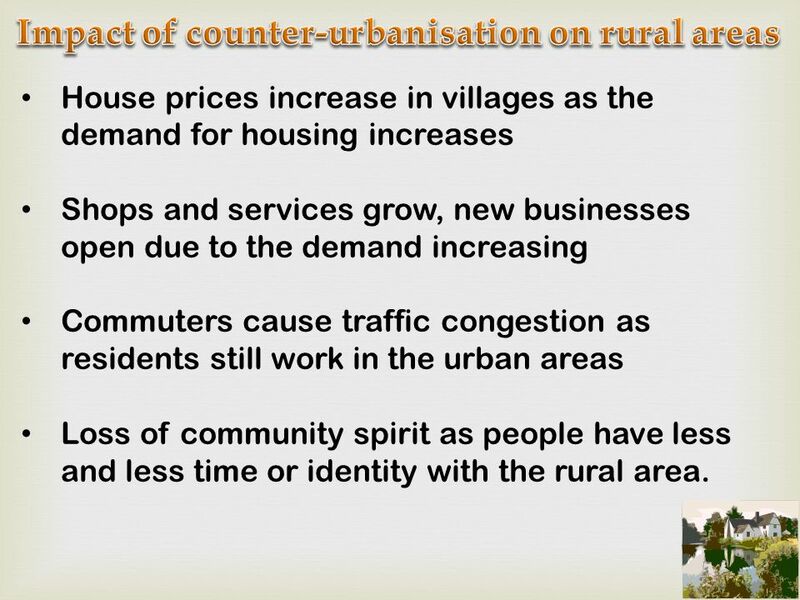 Counter-Urbanisation: Moving from the city back to the countryside. A change in lifestyle from city- based settlement to a rural landscape. 6 Cities with 10 million plus. 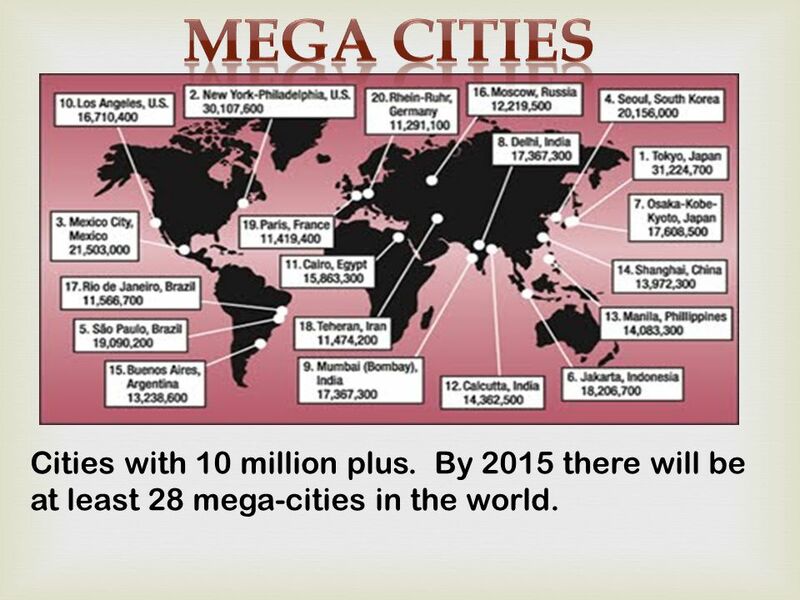 By 2015 there will be at least 28 mega-cities in the world. 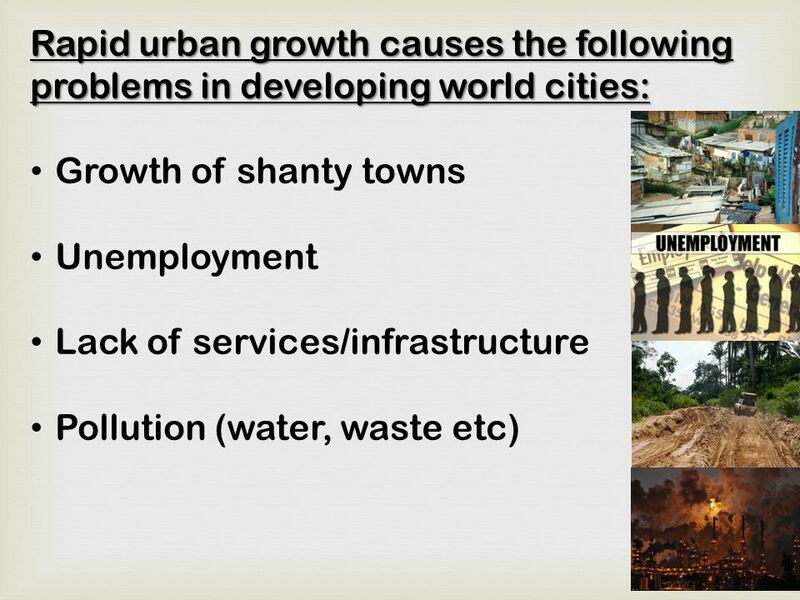 7 Problems of urban growth in developing world cities Urbanisation in developing countries is more of a problem than a sign of development. It shows rural problems as the people are moving to the city areas. Why? Remember Sudan?? 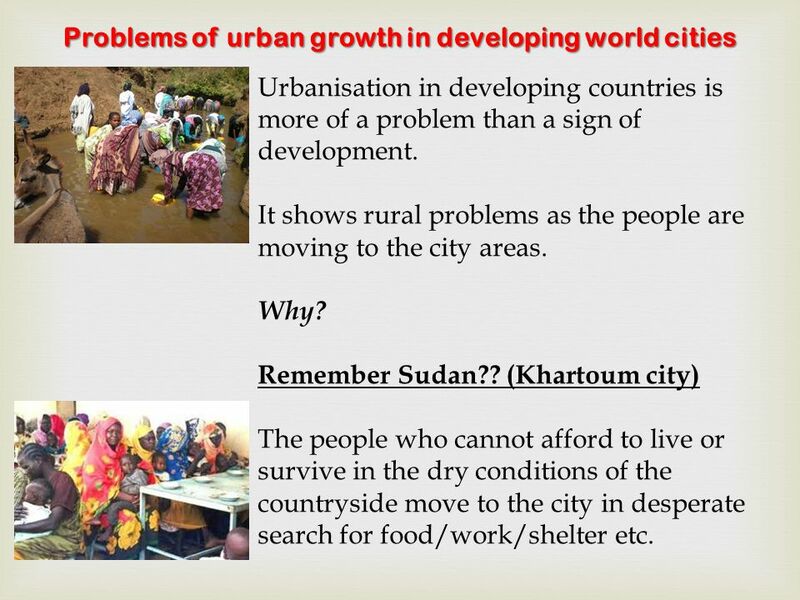 (Khartoum city) The people who cannot afford to live or survive in the dry conditions of the countryside move to the city in desperate search for food/work/shelter etc. 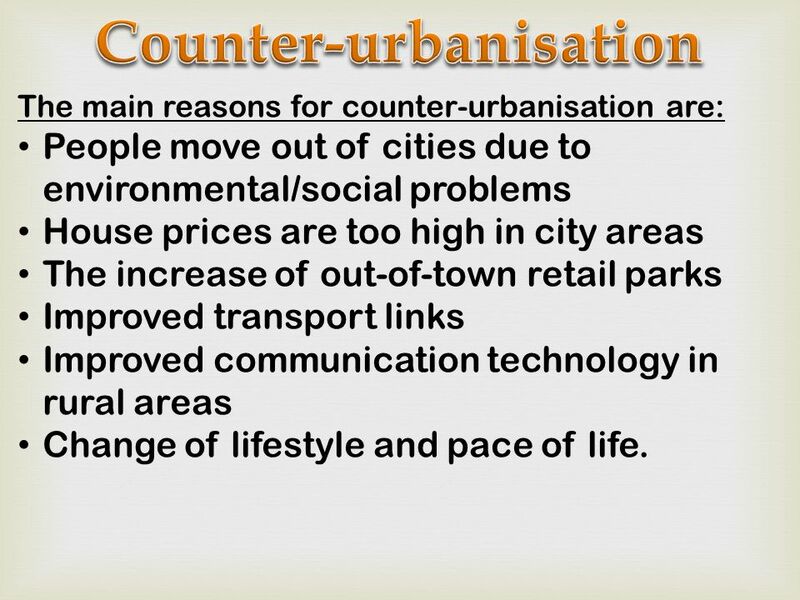 9 The main reasons for counter-urbanisation are: People move out of cities due to environmental/social problems House prices are too high in city areas The increase of out-of-town retail parks Improved transport links Improved communication technology in rural areas Change of lifestyle and pace of life. 12 House prices increase in villages as the demand for housing increases Shops and services grow, new businesses open due to the demand increasing Commuters cause traffic congestion as residents still work in the urban areas Loss of community spirit as people have less and less time or identity with the rural area. 13 Sustainable living ensures that resources are not overused or misused and plans are in place to protect the planet now and in the future. 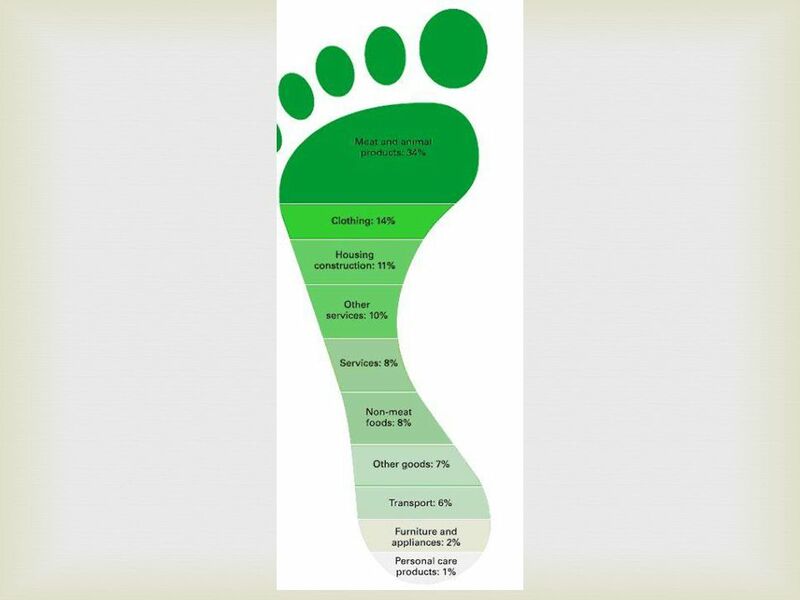 The ECOLOGICAL FOOTPRINT is the ‘mark’ left on the landscape by the people of an area or country. 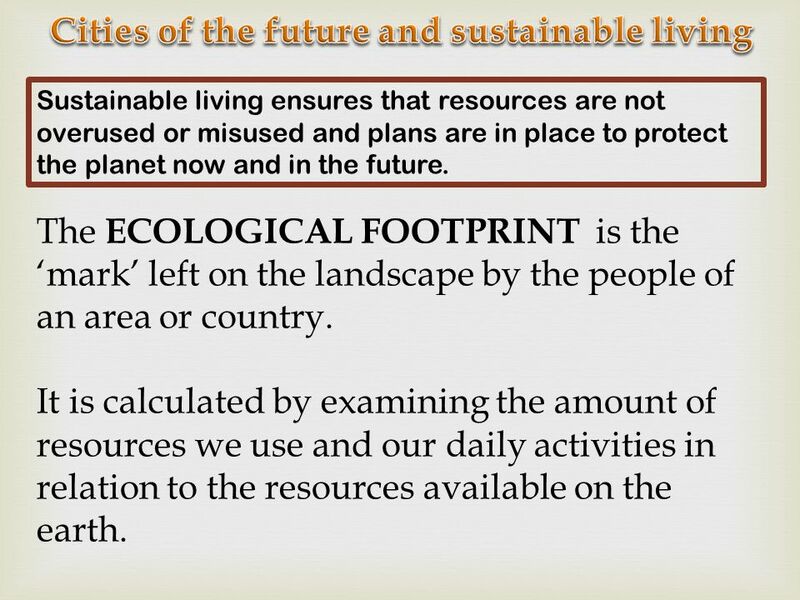 It is calculated by examining the amount of resources we use and our daily activities in relation to the resources available on the earth. 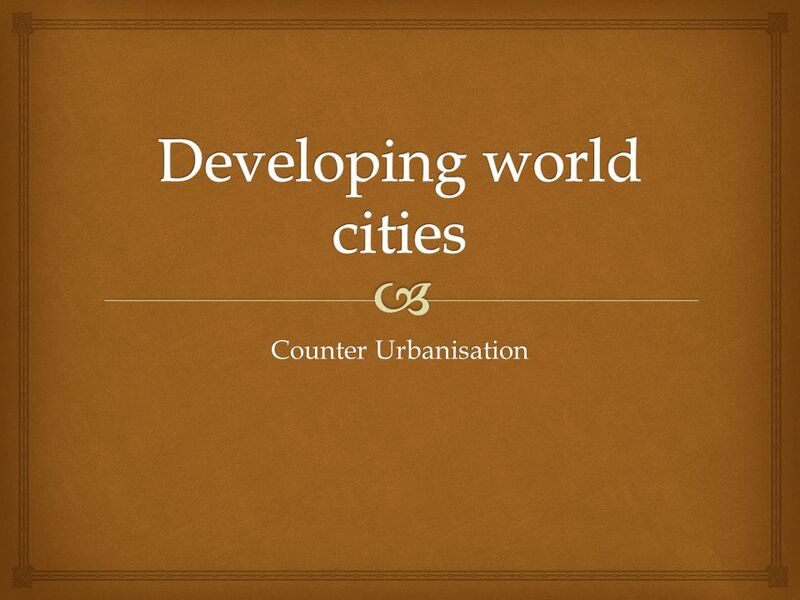 Download ppt "Counter Urbanisation. 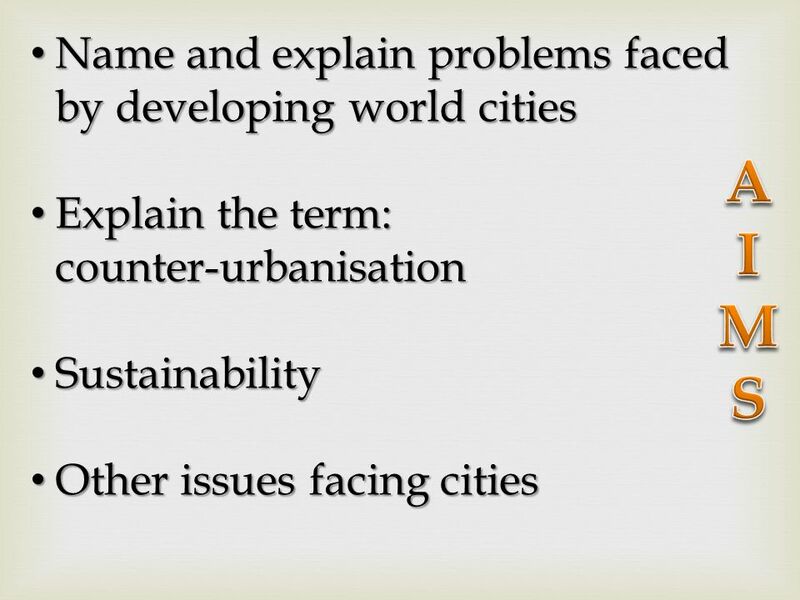 Name and explain problems faced by developing world cities Name and explain problems faced by developing world cities Explain the." 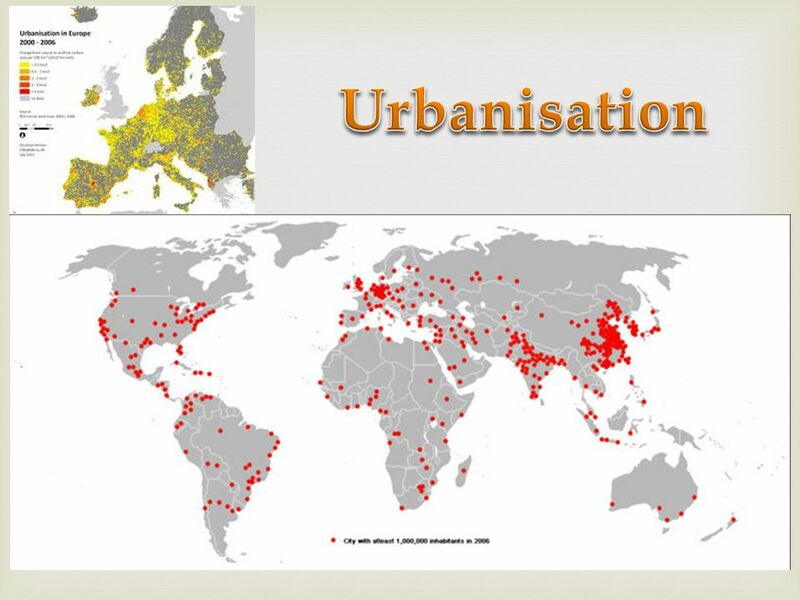 Changing Urban Environments Why are the world’s cities growing so fast? How are cities changing? Are cities in the poorer countries of the world places. Changing land use in Urban areas LO: I understand what Greenfield and Brownfield sites are I can explain the consequences of building more housing I can. A 21 st Century challenge. 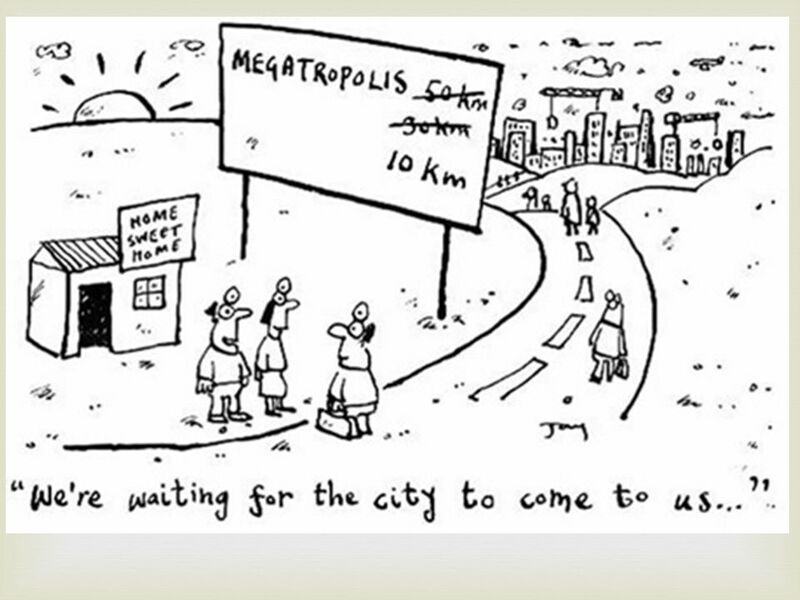 Urban sprawl is the uncontrolled growth of a city outwards into rural lands. It is caused by the migration of people into urban. 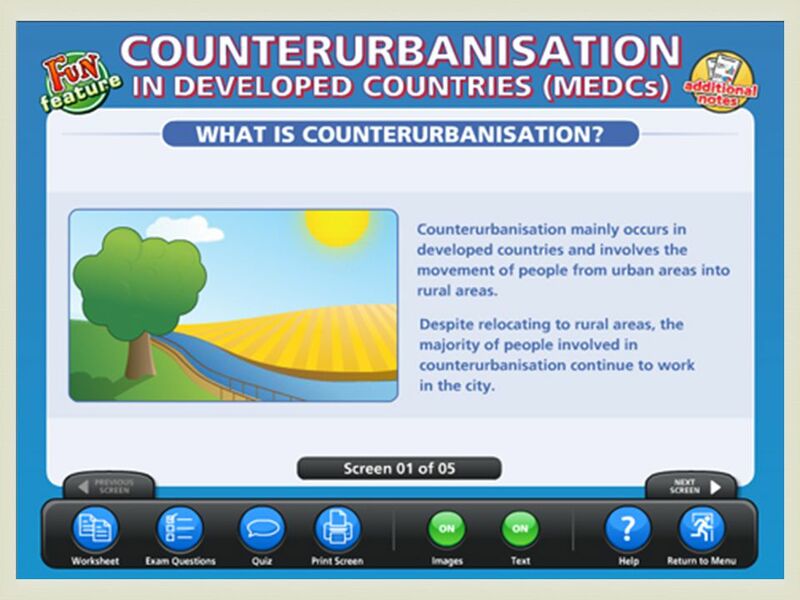 Rural-Urban Migration Developed World Case Study; Dublin. Burnet County Comprehensive Plan.  What Is the Comprehensive Plan? This is a county strategic plan that will focus on the areas where the county government. The Rural-Urban Fringe & Green Belts Aim: To find out what has happened on the Rural-Urban Fringe and why Green Belts have been set up by the government.